New Berkshire pontoon boats feature super-grade components, pioneering performance features, and enticing amenities. 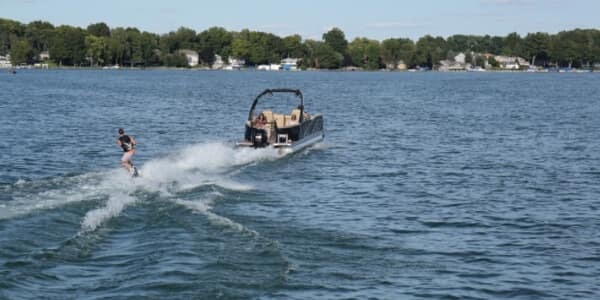 These watercrafts represent the ideal way to take to the clear blue waters around Rice Lake, Hayward, and Cumberland, and a variety of options help you enjoy a boat that fulfills your desires. Berkshire pontoon trims are broken down into CTS, STS, Ultra, and Sport models — here’s a quick overview of what makes each stand out. An entry-level pontoon with premium features, the Berkshire CTS offers spacious 10-foot bimini tops and 16-foot on-center cross members. Materials are top-notch, and features include a Bluetooth-compatible audio system. The STS delivers everything you’d expect from a high-end pontoon, plus a few you wouldn’t. Added horsepower makes long-distance cruising or sportier performance an STS staple. The Ultra line revolves around uncompromising luxury, with soft-touch vinyl, teardrop bench seating, and flowing rail systems marking them as a cut above. Available features include a JL audio subwoofer, amplifier, and speakers. For everything from water-skiing to high-performance power, the Sport is where it’s at. A USB charging port, AUX port, and Bluetooth come standard, as does a stern remote-controlled radio with Kicker speakers. Long nose cone for improved fuel efficiency and hydrodynamics, with lifting stakes on the inside of outer tubes for responsive turning and a tighter turning radius. Roll-formed aluminum underdeck skin to expertly manage water and airflow for enhanced agility and durability. Forest River marine pontoon tubes for added strength and longer life across more extreme conditions. More strength for longer life in extreme water conditions. The last step to customizing your pontoon boat is choosing a floorplan. A strong selection is available across trims. Whether you require space for a couple to sit comfortably, built-in dining tables suitable for the entire family, or sprawling dimensions to accommodate richer seating options, Berkshire Pontoons can accommodate. Need assistance selecting your ideal new or used Pontoon boat? Wondering what affects pontoon boat prices? Don Johnson Motors is just a phone call away, so feel free to contact us today or apply for financing. You can also visit our dealerships in Hayward, Rice Lake, and Cumberland.